This is the article for those who are only beginning their PrestaShop 1.7.5 journey. Though the tool is easy-to-use and intuitive, it’s always good to get an understanding of the navigation, functionalities and basic notions. So I’ll walk you through all the things you need to know at the very beginning. As you’ve logged in, you see an Administration panel. In PrestaShop 1.7.5 it’s not dramatically different from the previous version. PrestaShop logo sends you to the dashboard. Quick Access. 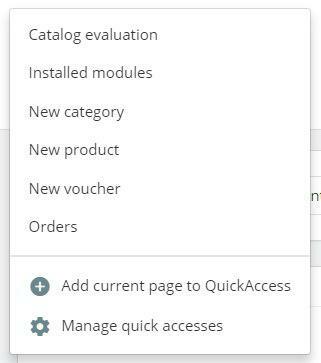 If you click this tab, you’ll get to the dropdown menu containing important links links like “Catalog evaluation”, “Installed modules”, etc. Search field has a dropdown list, which allows you to search among all the content or in a certain category (eg. “Customers”, “Orders”). View my shop button will let you see shop’s front-end. Bell icon in the right corner shows notifications on new orders, messages and customers. Personal menu is opened by clicking on the far-right icon. The panel contains 2 links: “Your profile” sends you to the account Settings page where you can edit general info like username and “Sign out” button to log out. The main menu is situated on the left by default, however you can change its position at “Admin menu orientation” panel. The dashboard contains links divided into 3 major groups: SELL, IMPROVE and CONFIGURE . Let’s consider each of the section in more detail. Orders – when a client adds goods in a shopping carts, their order immediately appears in this tab together with the invoice. Through this tab you also manage returns, credit slips and customer service. Catalog – is where you add your products for sale, create categories, handle partners and suppliers, etc. Customers – the tab containing all the information on your clients: names, addresses, order history, etc. You can unite them into groups and categories and give special discounts. Customer service – here you implement and manage all the interactions with your customers over the order. Stats – in this tab you can find a number of stats and graphs reflecting your different kinds of activity in PrestaShop. The IMPROVE group contains instruments for your webstore customization. Design – this tab contains theme, pages (CMS), modules and image settings, allowing you to give your webstore an individual look. Shipping – contains data on delivery details, carriers and shipping rates and costs. Payment – In the Payment Methods tab you set and manage payment methods for your shop, while in the Preference tab you set the payment currency for each country. International – in this tab you configure Localization, Locations, Taxes and Translations details. The CONFIGURE group consists of Shop Parameters and Advanced Parameters. This is where you perform specific configuration of your web store. Shop parameters – the place to set basic characteristics like Main Shop Activity, Brands and Suppliers, etc. Advanced parameters – this tab is for technical advanced features which is supposed to be set at the beginning and configured rarely. So this is everything you need to know about the main menu in PrestaShop in the beginning. We hope this article was useful, and if you have something to add or a question, feel free to leave us a comment.